In an interview, the ‘father’ of India’s Green Revolution says while technology is necessary, policies on procurement and public distribution are far more important in making agriculture economically viable and sustainable in the country. No one has played a more instrumental role in India’s self-sufficiency in food production than Dr MS Swaminathan — world-renowned agricultural scientist, known as the ‘Father of Green Revolution in India’. After getting a PhD from Cambridge University and further foreign training, he returned to India and served in various capacities as scientist, teacher, institutional builder and administrator. MS Swaminathan chaired the National Commission on Farmers (2004–06) appointed by the Union Government in 2004. The Commission submitted five reports in 2006, outlining comprehensive measures required for the sustainability and viability of agriculture in India. 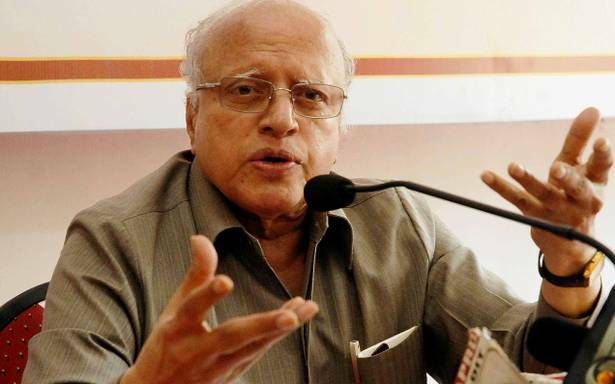 A recipient of numerous awards and honours, Swaminathan also served as a nominated member in the Rajya Sabha from 2007 to 2013. He founded the MS Swaminathan Research Foundation in Chennai in 1988 with proceeds from the First World Food Prize he received in 1987. The foundation works to advance the use of science for agricultural and rural development and for dissemination of technology to improve lives and livelihoods of tribal and rural communities. Your father was a medical doctor and you got an opportunity to pursue a career in medicine too. Later you qualified for the Indian Police Service. But you chose agricultural studies. What was the motivation? My father was a medical doctor, and a famous Gandhian. He had fought for temple entry for dalits, for abolition of dowry, etc. He had built a big hospital at Kumbakonam in Thanjavur district in Tamil Nadu. But he died at a very young age in 1936, when I was 11 years old. I was being groomed to go to medical college. Since my younger brother went into the pharmaceutical field and there was no one else in the family to take over management of the hospital, I was told by my mother, my father’s brother and my entire family that I had to manage the hospital. I was studying BSc in Zoology at Maharaja’s College in Trivandrum, Kerala (now known as University College, Thiruvananthapuram). I took Zoology and Chemistry. This was from 1942 to 1944. In 1942, Mahatma Gandhi led the Quit India Movement. At the same time, there was the infamous Bengal famine. Every day newspapers carried reports of people dying of hunger. We were all idealistic at that time. I thought the best way to serve the country would be on the food production side. So, I told my family that I would not take admission in medical college but would apply to agricultural college. I applied to Madras Agricultural College in Coimbatore (now Tamil Nadu Agricultural University. Even the principal had asked me why I had come there, given that I had got good marks? Agriculture had quite a bad social status. That is the reason I decided to go for agriculture. Within agriculture, I decided to go into genetics and crop improvement, because I thought it would help the maximum number of farmers with a new variety of crops that are high-yielding and resistant to certain diseases. That shaped my future. I did not look back after that. Since 1944, I have been in the same field. You have often spoken of Gandhi’s influence on you. How did his philosophy shape you, and what do you think is his relevance today? Children inherit the values of their parents. My father was a Gandhian. My mother used to make us spin Khadi for one hour every day. It was compulsory for us at home. So the concept of swadeshi had a very important influence on us. I applied the same principle in agriculture — self-reliance in food production. So, I’d say that Gandhi’s concept of self-reliance shaped my own research strategy. Gandhi and his ideas are ever-relevant, especially given the young population of our country. Our ability to harness their curiosity and creativity will be very important. In these times, we hear a lot about ‘brain drain’. But in your case, it was the opposite. You were offered a lucrative career in the US. Why did you turn it down? At first, I went abroad. I had got a fellowship to go to Holland. Holland appealed to me because it is a small country with high-value agriculture. Since our country needed more income for farmers, I thought we could learn some things from Holland. So, I decided to go. Then I tried to do a PhD at Cambridge. After that I was in the US. But then I thought, this is enough. I should go back to my country and start applying my knowledge. At the time, the president of the University of Wisconsin had offered me a very lucrative job as associate professor. But I told him I had come to this country to learn and to go back to serve my country. He appreciated that very much. So, I came back and was located at Central Rice Research Institute, Cuttack, Odisha. Then I shifted to the Indian Agricultural Research Institute, where I had studied. You are hailed as the ‘Father of Green Revolution in India’. What were the circumstances that necessitated the Green Revolution and how do you assess its achievements? The term ‘Green Revolution’ was coined by William Guad of the US. Green is the colour of chlorophyll, which is the pigment in plants that captures sunlight and takes nutrients from the soil, and then produces the food. Therefore, the Green Revolution is more about capturing sunlight. Agriculture is the largest solar energy enterprise. Therefore, Green Revolution was the method of expressing our gratitude to sunlight and green plants -- the two legs of our existence. As for me being called ‘Father of Green Revolution’, I was not responsible for that. I always say I am a father of three fine girls! Before the Green Revolution, we were entirely dependent in terms of food. In fact, we imported 10 million foodgrains in 1966. An independent foreign policy was not possible as long as it was dependent on somebody else’s grains. I would say in areas like Punjab and Haryana—the heartland of the Green Revolution—agriculture is still going well. Farmers learned the technique to use fertilisers. If you go to villages in Punjab, they will tell you what to do and what not to do. In fact, one of them told me that the Chief Minister was giving subsidy to pump more water — and that farmers’ interests would be harmed because people would have the temptation to take more water than necessary. So, they have come to know what is in their long-term interest and what is not. There is a general criticism of the Green Revolution that the practice of indiscriminately using pesticides and fertilisers had degraded soil fertility, led to over-exploitation of ground water, etc. You had warned against this during the Indian Science Congress at Varanasi in 1968, and later you used the term ‘evergreen revolution’. What is the concept of ‘evergreen revolution’? Yes, I have condemned the excessive use of pesticides. Rachel Carson of the US had expressed this in her book, Silent Spring. At the Science Congress in Varanasi, I made a comment that was widely quoted. ‘Evergreen revolution’ is a term used to mean when ‘productivity advances in perpetuity’. It is another term for sustainable agriculture. When there was criticism of the Green Revolution, we’d thought criticism came from those who were not farmers. If you had gone that time to Punjab, Haryana or Western Uttar Pradesh, farmers were so happy. The man who used to harvest one tonne per hectare got four times more, and could sell three times more than the normal. Today we are in the midst of an agrarian crisis. More than three lakh farmers have committed suicide in the past two decades. According to socio-economic surveys, the income of farmers is declining. There are other issues like rural migration, displacement, etc. What is the cause of the Indian agrarian crisis? The agrarian crisis we’re witnessing has been dealt with in detail in the Farmers’ Commission report, of which I was the chairman. There are five reports. Those reports dealt with why and what are the problems of farmers today. Monsoon and markets are the two major problems. Today governments talk about announcement of the minimum support price (MSP). But unfortunately, procurement is very poor. You have to have minimum support price. You have to have public procurement and public distribution. All of these are very important. People like Mahendra Singh Tikait (farmer leader) had complaints about this, back in in those days too. They said agriculture is no longer economically viable, that we cannot ask our children to go into agriculture. They have to find some other profession. We have been witnessing farmers’ agitations in various parts of the country. One of their demands is the implementation of the draft report of the National Commission on Farmers chaired by you. You submitted the report in 2006. Why have successive governments hesitated to implement it? It is true that farmers’ demand is to implement the Swaminathan committee report. Particularly, the one related to procurement and pricing C2 + 50% (total cost of production + 50%) for MSP. Governments have increased the price now, but farmers are finding it difficult to manage agriculture. And there is no other occupation for them. There is a job famine in our country. Agriculture is job-led growth while industry is jobless growth. Income of farmers is declining mainly because of the two factors I’d mentioned — monsoon and markets. The root cause of Indian agricultural crisis lies in economics. I am a technologist. Technology and public policy are both very important. But ultimately, while technology is important for farmers, more important are procurement and public distribution. So, unless the occupation is economically viable and ecologically sustainable, it will not sustain. The Farmers’ Commission was first conceived of by Atal Bihari Vajpayee in 2004, when # Rajnath Singh was the Agriculture Minister. They set up the farmers’ commission. But within two months, the government changed. Sharad Pawar came as Minister. He wanted me to chair the commission. I asked for two years of time. In two years, not one day less or one day more, we submitted the report, but we submitted it in parts because I thought the minister would be too busy to read a huge report. But the Manmohan Singh government did not implement it. The BJP government included it only in the election manifesto. There has been a slight improvement in the prices of commodities, but not really. One of the main demands of farmers is loan waivers. You’ve said that loan waiver is a short-term measure and not a solution for making farming viable. Can you elaborate? Loan waiver is not a method at all. Because what are loans? You take money from the bank. The money in the bank is what you and I deposited for earning some interest on our money. Now taking the capital out and giving it out as loans, whose money is it? It is not correct. It’s not viable over a long period of time. More important is to make agriculture more viable and yield better. I would prefer my own pricing formula, which is C2 + 50%. That can help farmers on a long-term basis. If a year sees huge floods, like in Kerala last year, you may need to write off loans. There is no other way. I know in Kuttanad in Kerala, there is a lot of damage to agriculture due to floods. There I would recommend it. But it is not a method of strengthening agriculture. In July, the Union Government announced new MSP of 14 Kharif crops for the 2018-19 season. In a statement, you said this MSP was still below your commission’s recommendations. There are various ways to calculate MSP. What would be the most viable MSP calculation? The MSP is still below our recommendation because it has not taken into account C2, meaning cost of production. You need to include the imputed value of family labour, land cost, the interest on land, etc. Merely taking expenditure on inputs for fertiliser and seeds and labour, will not give you the whole cost of production. That is why the MSP is below the recommendation. The viable calculation is mentioned in the Farmers’ Commission report. One of the major problems in India is the concentration of land in very few hands. Except for a few states, land reforms are still incomplete. But you go beyond the concept of land reforms and suggest reforms in terms of assets, including water. How significant is that for a country like India? Land reform was talked about even when I was student of at agriculture college. Two states that implemented it somewhat are Kerala and West Bengal, mainly because of the communist governments. In Kerala, I had some land that was gone. I did not mind giving it up as long as a farmer took it. Even in the Farmers’ Commission report, land reform was one among pending items. It does not mean just redistribution of land, but also the surety of jobs for landless labourers, who should not be thrown out. Because when we talk about agriculture, we do not talk about landless labourers and women. Asset reform is premised on the fact that agriculture requires not only land, but also water, electricity, ground water utilisation, technology that is environmentally sound and marrying of ecology with technology development. Usually, people think that land reform means just giving land to the people. What will they do? They have given land to Gujjars in Kashmir, for example. They do not know how to farm the land. So, you should give them training. Ours is a holistic package. Land is just a fragment. Land reforms should be expanded to asset reforms. These days agricultural land is diverted for various purposes, such as handing over to corporates. You recommended the need for a land use policy. How should this policy be, especially from the perspective of agriculture? Land use policy should be based on home needs plus market availability. First of all, farmers will look after their home needs. If I am a rice-eating person, in Punjab for example, farmers grow Basmati rice. Even if the yield is a little less, they want to have good rice. Land use policy will be one for sustainable food security and sustainable agricultural trade, agricultural income. India has been seeing unprecedented farm suicides after the adoption of economic liberalisation policies. How do free trade agreements and deregulation of import restrictions affect farming? You recommended an Indian trade organisation. What is the need for it? Farm suicides have been studied in detail by P Sainath. When I was Farmers’ Commission Chairman, he took us to houses where there were suicides. If you go with them (government officials), you will not get to know anything. He said the officials want to whitewash the suicides. A person commits suicide when he or she can see no other way. I wrote a lot about it. Unfortunately, social protection has also gone down. We all know who is in despair and who is likely to commit suicide. Yet nobody helps them, not even the government. Everywhere there are only individual interests and private interests. Everything has to be studied carefully. You have got international trade agreements. I always say there should be green box subsidies for livelihood security, just as the World Trade Organisation (WTO) has other green box provisions. In 1992, I’d recommended a livelihood security box for those whose livelihood is in agriculture. Ours is a livelihood industry. In America, it is a commercial industry, money-making industry. There is difference in agriculture in India and in some other developing country. In industrial countries, agriculture is one more profession to make money. Here it is basic livelihood. I recommended an Indian Trade Organisation because we should have our own policies of trade that are based upon the viabilities of farming and food security. We are a large country with a huge population. And we should have our own policies. Influencing the WTO beyond an extent is not possible. P Sainath has reported several painful incidents of women farmers, who have committed suicide but haven’t been recognised as such because their names are not there in the patta (land document). Against the background of ‘an increasing feminisation of agriculture’, you introduced the Women Farmers’ Entitlements Bill in Rajya Sabha on May 11, 2012. How important is the legal recognition of women farmers? Legal recognition of women farmers is very important. Women constitute the major part of our farmers. Without addressing the issues of women farmers, agriculture will not be sustainable. Land title ownership of women is also very important. What is your take on the introduction of genetically modified (GM) crops in Indian farms? How would it affect the Indian farm sector? There is no need for GM crops in Indian farms, unless there is some problem that cannot be solved by normal genetic breeding or Mendelian breeding. In my research foundation, we have a biotechnology unit. They have taken genes from mangroves for salt water to transfer it to rice because in the coming years, the sea level will rise and we will need to have varieties that are salt-tolerant, sea-water tolerant. Just like this, in special cases you can use genetic modification, but not as a general method. One of the main ideas that inspired the Green Revolution was self-reliance. But today that enthusiasm for self-reliance in public policies seems to have waned. How important is self-reliance? Swadeshi was the idea behind the Green Revolution. Independent foreign policy is only possible with food security. Therefore, food has more than just eating implications. It protects national sovereignty, national rights and national prestige. Currently we have a targeted Food Security Act. You have recommended a comprehensive food security Bill that ensures nutrient rich-food availability for all. What is its importance in country like India where the world’s largest numbers of hungry people live? I’ve always believed we should go for food nutrition security. I added a sentence in the Bill. There are three aspects of food security in the Bill. One is adequate availability of food, which is a function of production; then adequate consumption, which is function of cost of living; and then adequate distribution, which is the public distribution system, mid-day meals in schools, etc. Economic insecurity, low productivity and lack of modernisation are the major challenges of Indian agriculture. But China tackled those challenges and modernised agriculture with the twin strategy of increasing small-farm productivity and income and creating non-farm employment in rural areas. What lessons can we learn from China? In China, there is no question of landless labour. Some of them get farming occupations and others get non-farming occupations. They try to address the problem not in terms of those who have land or are landless. Land is one asset. Those who have land should cultivate their land. Those who have no land should be given non-farm occupation, so that everybody is employed and has got some income. That is how China became a much more egalitarian country. They are the first ones to use hybrid rice on a large-scale to increase the income of small farmers. We can also adopt it. Unfortunately, our policies are quite poor. The twin strategy of increasing small-farm productivity and increasing non-farm income are very important. There is an argument that the 2018 Kerala floods were a man-made disaster. Do you agree? I do not agree that it was a man-made disaster. It was man-made only in the sense and to the extent that we humans have been abusing the environment over a long period of time, creating conditions for flooding. But the Kerala floods were unprecedented. Right now, climate change is a very important issue. Again, climate change is man-made over a long period of time. How do you evaluate the impact of Mahatma Gandhi National Rural Employment Guarantee (MGNREGA) scheme on the rural poor? The MGNREGA scheme is a very good programme. But it should include skilled jobs also. For example, women working in an anganwadi or a crèche, they should also be covered under it. They have unnecessarily restricted it to only unskilled jobs. What Mahatma Gandhi said was that everyone should learn skills. Technology and public policy should go together. I wrote to the parliamentary committee that it is time to include skilled work in the programme as well. We are just providing them employment for food security. We should not waste such a large human resource but should provide them skills and use those skills. For example, water management, watershed management, soil conservation can all be done more scientifically, if you have trained labour.